Enough plastic components to make 30 late war German Army miniatures. Includes a host of options to allow for different weapon configurations and command models. 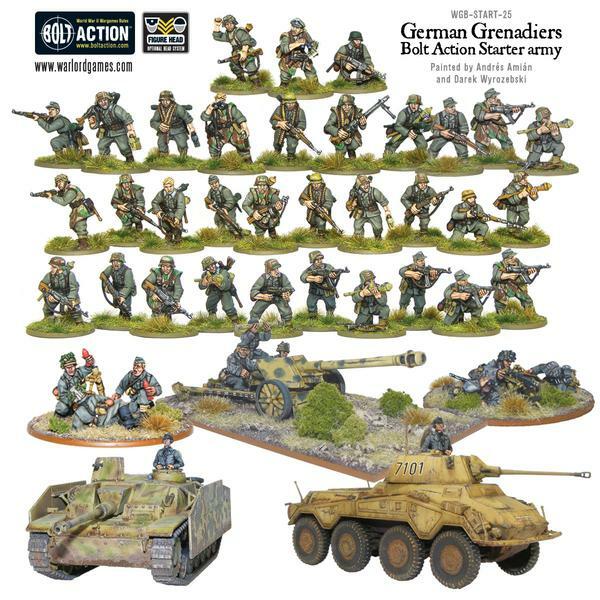 Equipment included: STG44 assault rifle, PPSh SMG, Kar 98K rifle, MG42 light machine gun, rifle grenade attachment, MP40 sub-machine gun,Kar 98K rifle, Gewehr 43 rifle, stick grenades, Panzerfaust, field glasses and even an Iron Cross medal! Round plastic bases (25mm diameter). Construction leaflet. Full-colour waterslide decals. 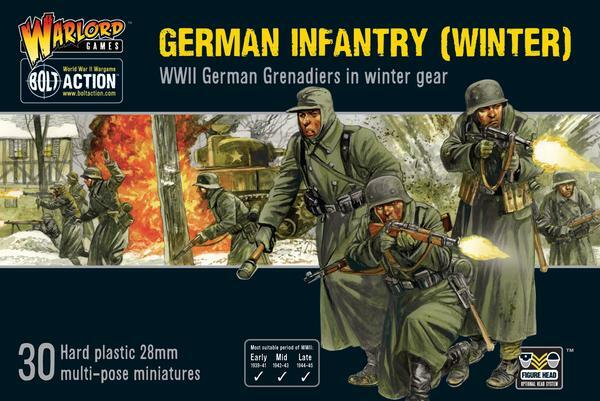 Plastic components to make: 30 German infantry figures in greatcoats. Includes options for different weapon configurations and command models. 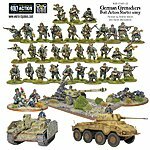 STG44 assault rifle, Kar 98K rifle, MG34 light machine gun, MG42 light machine gun, MP40 sub-machine gun, Gewehr 43 rifle, stick grenades and Panzerfaust. Round plastic bases (25mm diameter). Construction leaflet. Full-colour waterslide decals. 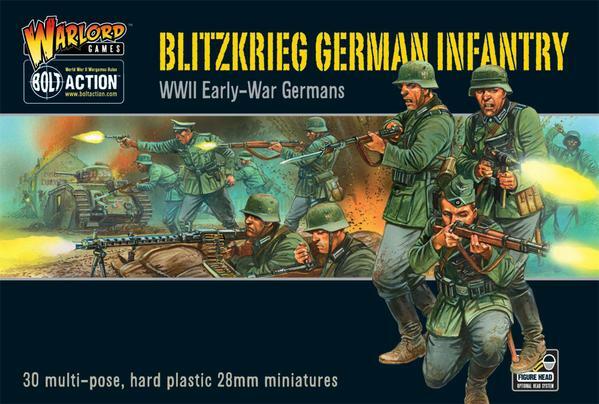 Enough plastic components to make 30 German infantry miniatures - Including a host of options to allow for different weapon configurations and command models. Weapons included: Kar 98K rifle, MP38/MP40 sub-machine gun, Luger pistol, MG34 light machine gun, Kar 98K with attached bayonet, stick grenades, scoped Kar 98K rifle. Round plastic bases (25mm diameter). Construction leaflet. 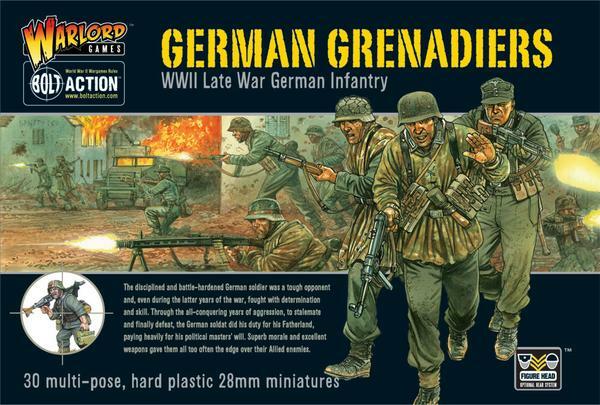 Plastic components to make 30 mid-late war Waffen-SS Grenadier figures. Includes options for different weapon configurations and command models. 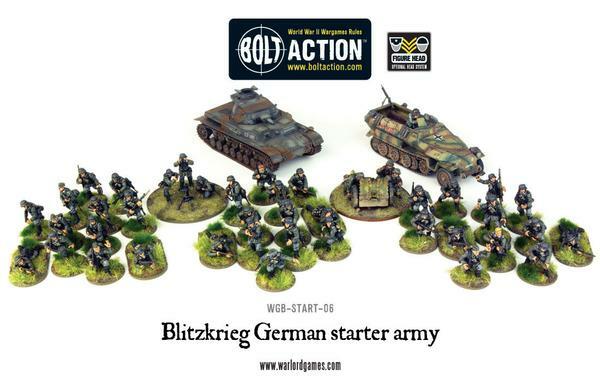 Equipment included: STG44 assault rifle, Kar 98K rifle, MG42 light machine gun, MP40 sub-machine gun, Gewehr 43 rifle, stick grenades, Panzerfaust, field glasses and a broom-handled Mauser pistol! Round plastic bases (25mm diameter). Construction leaflet. Full-colour waterslide decals. The Tiger was hurried into action on the Russian front as a response to the heavier Soviet tanks that had caught the Wehrmacht unawares. Its massive square body and rounded turret was an intimidating sight to enemy tankers. The armour was tremendously thick and made of quality steel, making it largely invulnerable, at least frontally, to anti-tank fire. Its potent 88mm gun was a deadly weapon, effective against enemy tanks up to three kilometres and also firing a lethal high explosive shell. At 52 tons the Tiger was sluggish but its broad tracks ensured a reasonable cross country performance. Its crews were specially trained as it was an expensive machine to build and maintain. A well trained veteran crew of five men could take on several enemy tanks with a reasonable chance of defeating them all, with little danger to the crew or tank. Tigers were normally formed into separate heavy tank battalions and parcelled out by the high command wherever they were most needed, their presence normally being enough to tip the balance in that sector. 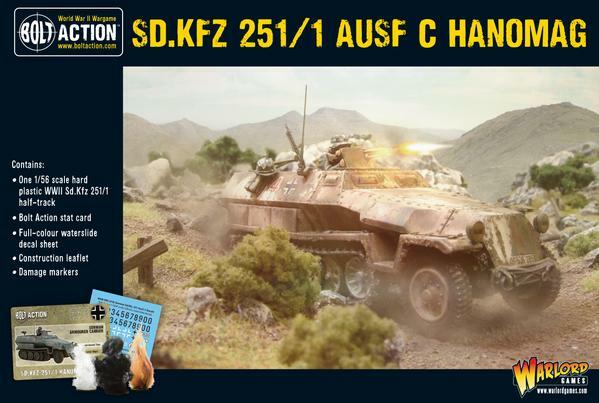 Model includes detailed German tank commander. Box contains 1 plastic halftrack, leaflet, Bolt Action stat card, vehicle damage markers and a decal sheet. 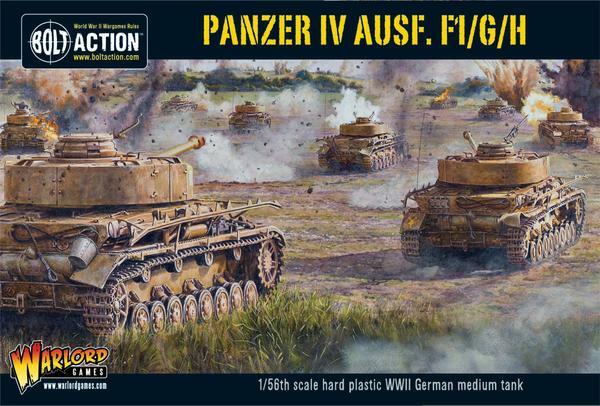 You can choose to build your Panzer IV as one of three different variants:The short-barrelled Ausf. F1.The long-barrelled Ausf. G with its distinctive ball muzzle brake. Respectfully known by British forces in the desert campaign as the 'Mark 4 Special' it saw action in the Western Desert and the Russian Front primarily.The Ausf H with its new muzzle brake and protective schürzen side skirts. 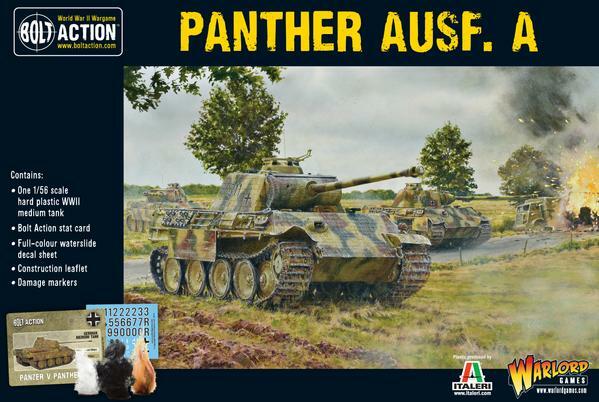 A regular sight on late war battlefields, the Ausf H is one of the iconic Panzers of the war.As with the other Bolt Action plastic vehicles, this kit is highly detailed yet easy to build. 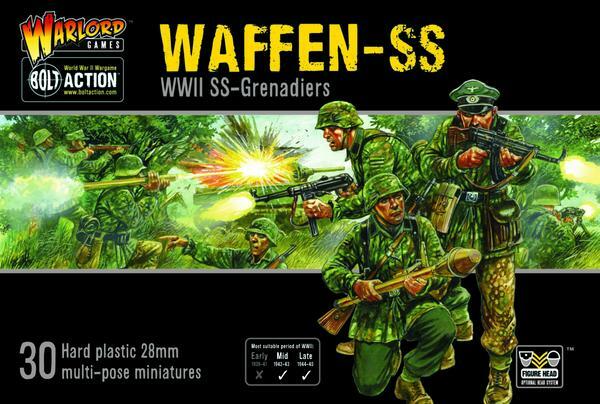 It provides a rugged gaming piece and will also appeal to painters and modellers. 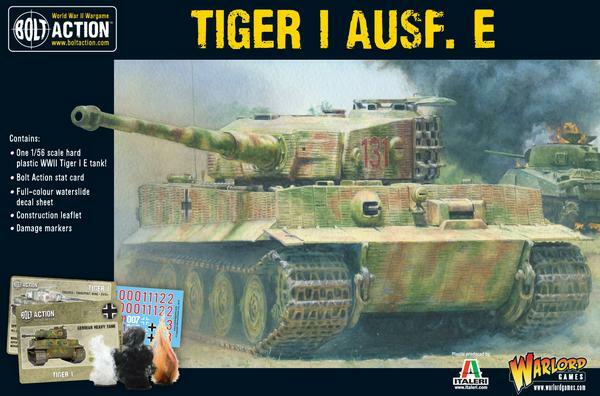 The Panzer IV comes with a comprehensive waterslide decal sheet, allowing you to finish your new tank off perfectly! 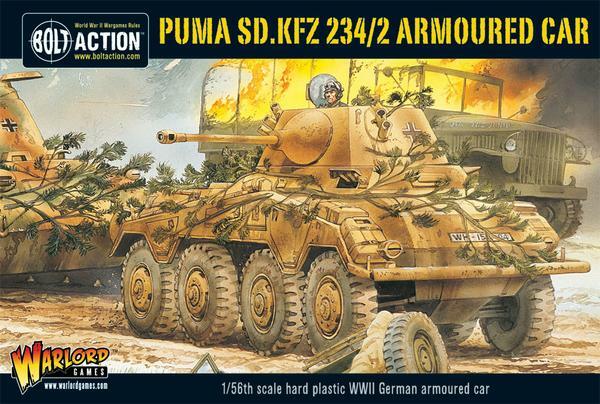 Box contains 1 plastic armoured car, leaflet and decal sheet. 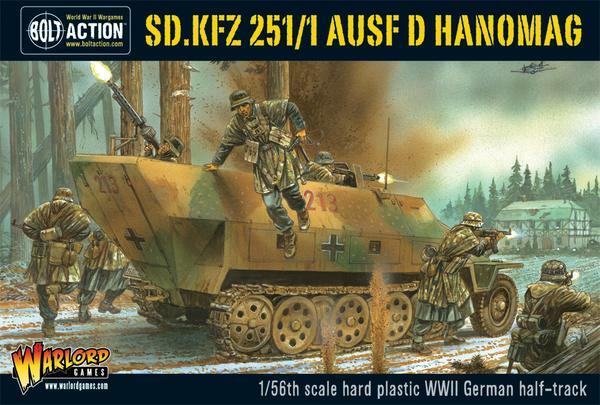 Box contains 1 plastic halftrack, leaflet and decal sheet. 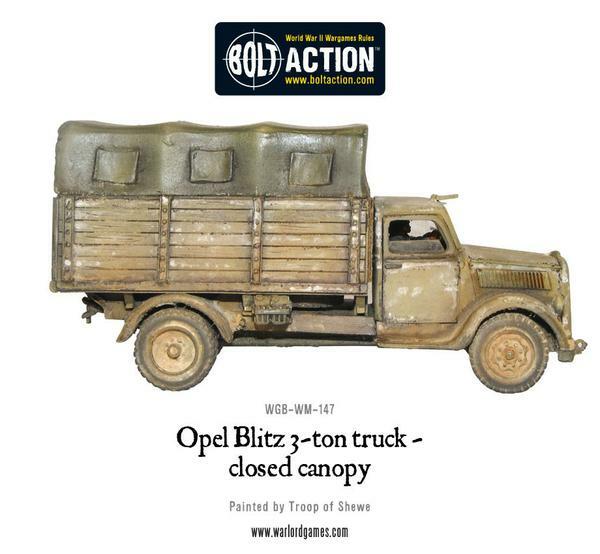 1 Opel Blitz Truck, metal pieces for detailing. Copyright © 2017 Gamer's Guild. All rights reserved.